We believe that all we have comes from God and we give it out of His hand (1 Chronicles 29:14b, Dutch paraphrase). We have a responsibility to be faithful stewards and to maintain integrity and openness in our financial practices. Therefore, we are committed to fulfilling sound, Biblical standards. We present needs to God's people, then trust the Holy Spirit to touch the hearts of those whom He wants to participate in meeting those needs. • Subscribing to a written Statement of Faith clearly affirming our commitment to the evangelical Christian doctrine. Advancing the Gospel of the Lord Jesus Christ is the singular objective of our financial conduct. • Maintaining governance by a responsible and involved Board of Directors, the majority of who are independent according to legal and accountability standards. • Meeting as necessary to establish policies, approve budgets, and review operational results and ministry accomplishments. • Using contributions faithfully and wisely, in accordance with our mission of meeting critical needs in ways that earn a hearing for the Gospel of the Lord Jesus Christ. In this light, fund-raising appeals will clearly identify the purposes and programs to which donations will be applied as the Board provides oversight to ensure that donations are used for the purposes for which they are raised. • Directing that contributions designated for specific projects be applied to those projects with the disclosure that up to ten percent of a contribution may be used for administering the gift. Occasionally, Samaritan’s Purse may receive more contributions for a designated project than can be wisely applied to that project. In that event, Samaritan’s Purse will endeavor to use the funds for a similar pressing need. • Contracting with an independent public accounting firm to perform an annual audit of our finances and ensure our financial statements are prepared in accordance with generally accepted accounting principles. 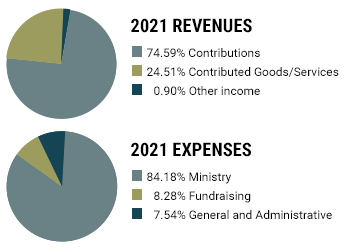 • Making our financial statements available on the Samaritan’s Purse website and to all who request them. • Making the annual Form 990 available on the Samaritan’s Purse website and to all who request the information. We follow a process whereby the Audit Committee of the Board accepts the Form 990 prior to filing with the IRS and the Board receives a copy prior to such filing. • Maintaining and complying with the Conflict of Interest Policy, Whistleblower Protection Policy, Record Retention Policy, and Code of Ethics. • Appointing an Audit Committee, the majority of whom are independent, to review the annual audit, other financial documentation, and report findings to the Board. • Seek to conduct Samaritan’s Purse activities with the highest standards of integrity and avoid conflicts of interest. • Avoid high-pressure, manipulative, or deceptive fund-raising tactics and respect the privacy of our supporters by never selling, leasing, or renting our mailing lists. • Avoiding indebtedness that dishonors the cause of Christ and hinders the work of the Gospel by timely paying vendors and fulfilling financial commitments. • To grow in knowledge and understanding of best financial practices for nonprofits to fulfill the fiduciary duty of care attributable to each Board member. • Respecting the privacy of our donors, we do not sell or rent our mailing list to other groups wishing to use the names and addresses of our supporters. We maintain tight security on our list of friends and supporters.